Use ePMV to import a model of RNA from the PDB or to build a length of DNA from scratch (use: Extensions>BuildDNA(w3DNA) ), it will be built at the same absolute scale at which autoPACK imported the HIV/blood model. Tom Goddard of UCSF's Chimera molecular modeling team has created a model of one strand of the HIV RNA genome you can try to import with ePMV (Set "default representation = None" in ePMV Options first!) then make a coarseMolSurface or a spline or worm, then use your 3D tricks to try to pack 2 copies of this into the interior of the HIV capsid without overlaps... good luck! We are working on a more rigourous model with all of the basepairs maintained. Here is a rendering of the Capsid, a 100base strand of DNA (shown as MSMS (realistic space filled), ladder model, and with one strand removed to imply the space occupied by RNA), then a 66base strand of DNA to give you and idea of the length of RNA packed into the model on the right which is a high-resolution (high confidence model) of an RNA machine- only 66 bases long 1u8d.pdb. 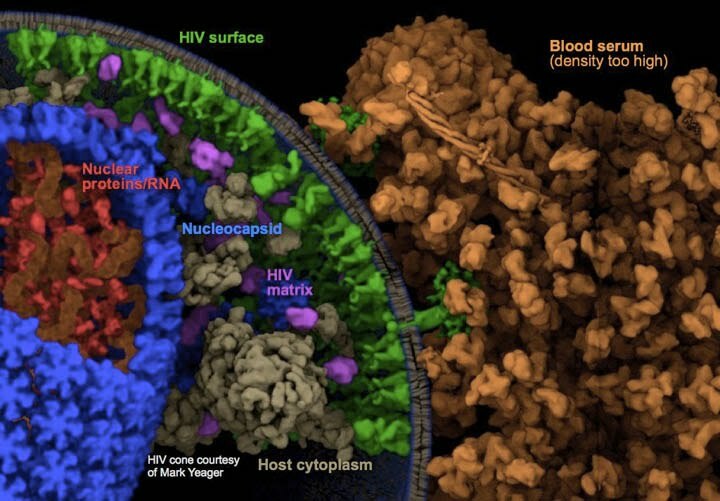 On the bottom the massive genome of one out of 2 of the entire HIV strands that HIV packs into the capsize to pack into the (along with all of the little proteins).